Our sterling silver bracelets are made to order in Italy for Booth and Booth and include fashion classics such as our silver ball bracelets as well as fashion must haves - see our silver link bracelets. 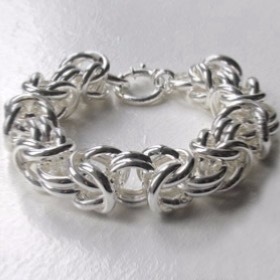 Our 3mm silver snake bracelets are those most often used for threading charms and beads such as Pandora and Troll. Explore our sterling silver bangles and cuffs and find designs from slim silver bangles to chunky statement cuffs. Our Silver Bracelets Are Available in Lengths 7" to 9"
Italian sterling silver popcorn bracelets & bangles.